With an anticipated federal budget in excess of $2 trillion for this year, one wonders if some belt-tightening might be in order. After all, the United States is still militarily engaged in Afghanistan and it seems probable that it will become so in Iraq. Wars cost money and larger wars cost a lot of money, but the governing class assures us that we can afford it. Apparently, we can afford a lot of things. Last year, the president and Congress created a new Department of Homeland Security, consisting of 22 federal agencies with 170,000 employees. As late as 1996, Republican congressional leaders and presidential aspirants were pledging to eliminate Cabinet-level departments, including at least the Department of Education and Department of Energy. Now there are fifteen Cabinet-level departments, with Homeland Security supposed to offer us something that the Departments of Defense and Justice couldn't. Given the terrorist threat and international crises occurring in places ranging from the Middle East to North Korea, one would expect that there would be more spending on national defense. Yet under President Bush's own budget proposal for fiscal 2003  as opposed to what the actual federal budget will be after whatever concessions the Democrats, particularly in the Senate, are able to win  allocates only about 18 percent of the federal budget to defense spending. This is an increase compared to recent years, when this percentage has been as low as 15 percent, but it is still less than the 26 percent of federal spending military expenditures represented in fiscal 1983 and 48 percent (!) in fiscal 1963. By comparison, mandatory entitlement spending will account for close to 60 percent. Looking at these figures and considering that we are projected to run a deficit this year, one might wonder if there is anything that could be done to move us closer to a balanced budget. There doesn't seem to be much evidence that anyone is working particularly hard to excise pork barrel spending. Just last year, Congress  with the White House's acquiescence - decided to ramp up farm subsidies, education expenditures and transportation spending. A prescription drug benefit for Medicare recipients? Still on the table. It will be shocking if at least one Democratic presidential contender among the members of Congress doesn't try to put national health insurance back into play. It's awfully hard to cut federal spending if the federal government keeps on assuming new responsibilities. So where do those who style themselves as champions of fiscal discipline draw the line? 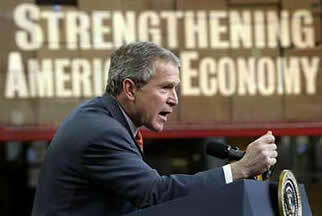 Why, at President Bush's stimulus plan of course. It is weighted too heavily in favor of tax cuts for the liking of avowed deficit hawks who have nevertheless never met a federal program they didn't like. Worse, most of these tax cuts would go to actual taxpayers rather than be credited to people with no tax liability at all. Eliminate punitive taxation of dividends? Lower marginal income tax rates across the board? These are the things that the federal government cannot afford. It is true that there are some people and organizations genuinely concerned about the budget deficit who are as critical of unwise spending practices as tax cuts; the Concord Coalition is probably the best example. But most of the caterwauling about how irresponsible tax cuts are is coming from people who continually support expansions in federal spending. For example, the liberal Center for Budget and Policy Priorities is claiming that these tax cuts will "cost" $2.2 trillion over ten years. There is nothing new here. Bill Clinton took office in 1993 after campaigning in part on a middle-class tax cut and eventually shelved the idea because the government could not afford it. Soon afterward, he and his wife Hillary (now the junior senator of New York and a charter member of the "we can't afford tax cuts" brigade) led the charge for national health care. After the voters accordingly threw out the Democratic congressional majority, Clinton steadfastly resisted most Republican tax-cut proposals as unaffordable through the 1996 presidential election. During that campaign, lower marginal rates were decried as a "risky tax scheme" that would "blow a hole in the deficit." Four years later, with the government now running surpluses even after Clinton agreed to some Republican-sponsored tax cuts, including a capital gains tax cut, Al Gore opposed marginal rate cuts. He warned that such as "risky tax scheme" would "blow a hole in the surplus." In other words, there is no conceivable fiscal scenario under which significant tax cuts to people likely to take risks and engage in other productive economic behaviors Democrats deem responsible or affordable. The point of tax cuts isn't to spur consumer spending  consumer demand is virtually endless, and consumers will always spend as much as they are able. Nor do tax cuts merely "put money in people's pockets," as even tax-cutters tend to assert. Lower tax rates enable people to keep more of what they earn. More importantly (from an economic perspective, that is - allowing people to retain the fruits of their labor is an important thing morally), lower tax rates enable people to keep more of what they will earn in the future. This is as especially true at the margins, where economic decisions are actually made. The benefit of lower tax rates is that they encourage people to do things that will cause them to earn and report more income. This may include working more, creating or expanding a business, investing more or otherwise contributing to economic growth. Lower tax rates on capital encourage capital formation, which in turn helps boost productivity, incomes and living standards. Lower tax rates on income generally encourage people to take place in income-generating activities, which helps create new jobs and make the consumer demand we hear so much about sustainable. Those who oppose deficits only when they are believed to have resulted from tax cuts are not being fiscally responsible. To fatten government, they are starving the goose that lays the golden egg of economic growth. W. James Antle III is a senior editor for Enter Stage Right.